The first thing that caught my attention with this book is how it is presented, a quick flick through the book suggests it is easy to read, and it is. But don’t think this book is lightweight in content. It is jam packed with lots of information and is written in a style that makes it easy to understand. Gihan is a storyteller and through the various stories he shares, he makes the points with ease and intelligence. I also really like his use of imagery to paint pictures – all very clever. These images make it very easy to grasp the key concepts and to put each of the concepts into action. It also helps you to remember them when you are transferring the learning to yourself and others. Step Up – focuses on you, your personal skills in particular your productivity, presentation skills and your personal brand. I found this section a really practical refresher. I reflected on how I was preforming, what were some things I could do to improve – my email ‘in box’ being a case in point and also how I could give more effective presentations. I really liked how Gihan has set out 5 levels at which you can deliver a message. I found this particularly useful for a recent Ignite presentation I gave where I had 5 minutes and for a fundraising event where I had 10 minutes to get my points across. Switch On – focuses on the team and how you can build a team whose members want to be part of it. In a world where we are all trying to be employers of choice, Gihan offers some ingenious ways we can support our team members. He helps us to see how we can help them to become innovators through tapping into their unique skills and experiences and how we can give them better development opportunities beyond traditional training courses. Spread Out – focuses on how you can reach out to a world, to people to help you achieve you goals. I found this section of significant importance to how we can and should do business, where the workplace is no longer defined by the physical place of work but by who the people are that work together to achieve an outcome. Gihan introduces the reader to so many possibilities for getting work done differently - whether that be permanent or temporary staff based in the same location, telecommuters who help deal with some of the inefficiencies of working in an office. He then invites us to consider how we can make partnerships work and lastly we are taught how to work with our natural communities to benefit civil society. This is much more than a book of well-expressed ideas. It is also highly practical, providing relevant examples and excellent exercises for readers wishing to engage in immediate application. I firmly believe that this book will support those people committed to improving the quality of their leadership, teams and business. 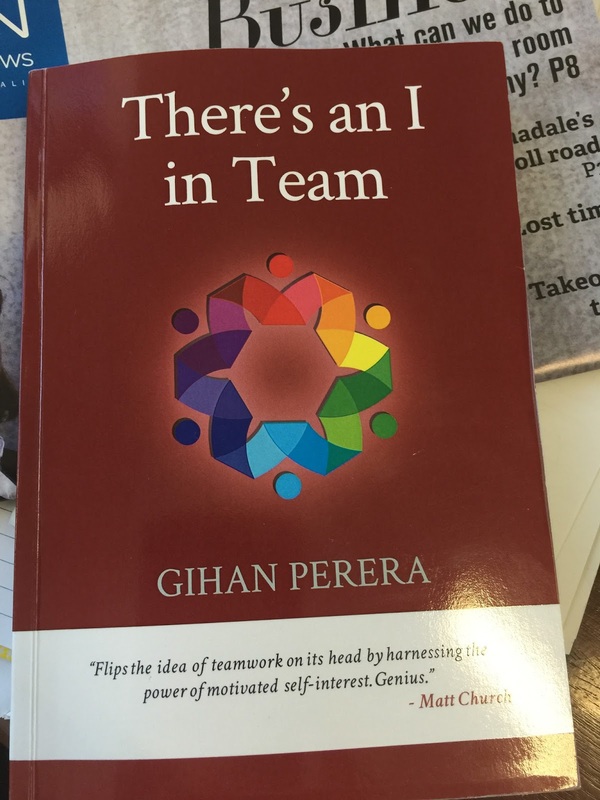 Book Review: Gihan Perera’s There’s an I in Team, this book really has a charm and now I think it is must for me to read this book real soon.